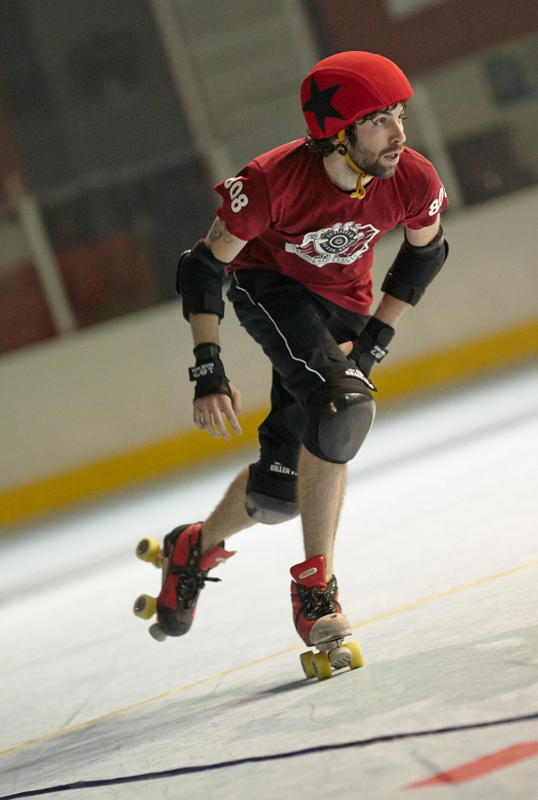 Greetings from Beat Monkey, one of the official bloggers for the 2014 Men’s Roller Derby World Cup. Beat Monkey in action. Photo by Jason Ruffell. So, a little about me: I am currently the captain of The Inhuman League and head referee at the Hulls Angels Roller Dames. I’ve been writing for even longer, ever since I could pick up a pen and pilfer a piece of paper. Previous gigs include working for an English-language newspaper in Ecuador and dodging kettles and tear gas to blog from protests in London and Copenhagen. Now, though, I’m about to embark on something even more ambitious and perilous as I delve into the fire and the fury that is the first ever Men’s Roller Derby World Cup. Throughout the tournament in March we will aim to give you summary match reports of every bout played as soon after the final whistle as possible. Keep up with the formidable four walls, the jittery jammers and the boisterous bench coaches, whether you’re in the arena itself or following from the comfort of your own home. Combined with our live stream broadcasts from each track, alongside constant coverage on Twitter, we aim to bring the World Cup to your mobile, tablet and computer. If you can’t make it to Birmingham, then Birmingham will make it to you! Plus, over the next few weeks, we will find out more about each of the teams taking part in the tournament as they make their final preparations. Swot up on each squad before the first whistle is even blown and ready yourselves for what promises to be a tournament of epic proportions. You can read all of those previews and the match reports here at MRDWC.com.